Calculator on Windows 7 operating system can perform lot of funtions besides the default mathemetical calculations. 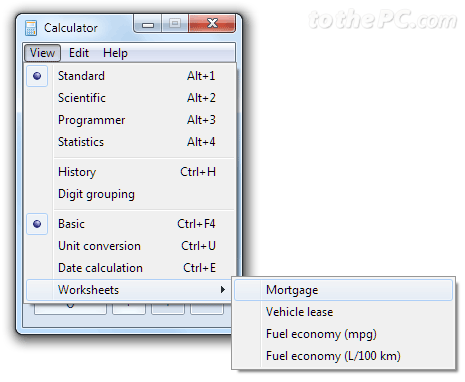 You can use it as handy tool for calculating mortgages, vehicle lease and fuel economy (mileage). These are in-built advance features of Windows 7 calculator which can be easily accessed on your Windows 7 computer. 1. Click Start (Orb) button and type calculator. Then press the Enter key to open Calculator program on your Windows 7 computer. 2. Then goto View > Worksheets and select either of option among: Mortgage, vehicle lease and fuel economy. 3. Select Mortgage option to making mortageg calculations. Select type of payment among: term, monthly, down payment, purchase price. Then enter price details, interest rate for final estimates. 4. For Vehicle lease calculation, select type among: lease value, residual value, periodic payment. 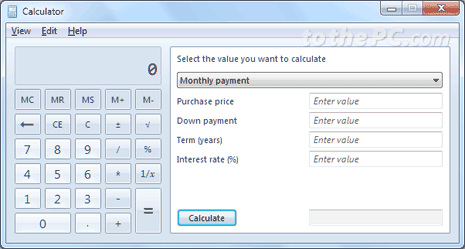 Enter the interest rate and click calculate button for final estimated value. 5. You can also use to calculate Fuel Economy or mileage. 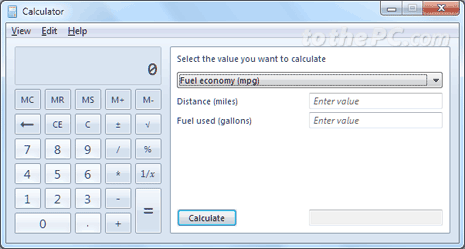 Enter distance travelled and fuel used and the click Calculate button to get final fuel mileage value. Hello, thank you for your tips, I find them very useful. I think you could also be interested in this free online mortgage calculator: mortgagecalculator3.com It has ARMs and shows you in graphs how much you are going to pay every month, how much interests you will pay in the end and many other things.